I’ve never been a fan of elaborate, vertical food presentation. Here you are at a restaurant and you are presented with a teetering assemblage of ingredients; now you have to figure out how to eat the damn thing. Start picking ingredients from the top? Pierce through everything and hope for the best? I usually take a fork to the pile and give it a good topple, ruining the precious presentation. To me, the best plating is when the plate continues to look good even after you have eaten half the plate, not when it looks like a demolition site. My friend Andrew, sent me this photo of a Caesar salad that he was presented with this weekend. 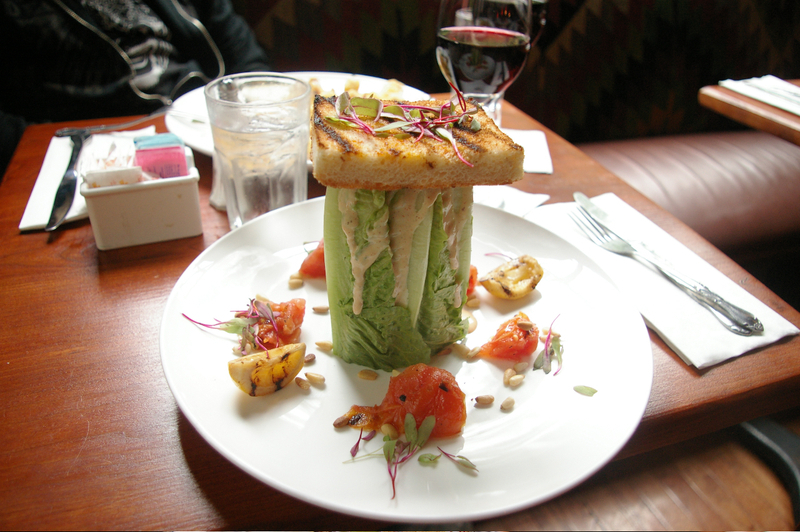 Now, aside from the ridiculous and ugly presentation, how could they even begin to call this a Caesar salad?? Mile high salad or skyscraper salad, anything but Caesar salad! Caesare Cardini is rolling in his grave. I am a chef at an Bistro Italian restaurant, and aside from the fact that is clearly not a Caesar salad (pine nuts? shredded cabbage? Water sprouts?? Tomatoes??? )it breaks a bunch of basic rules of plate presentation. Second, very sloppy color coordination to the palette. I’m assuming he was thinking green/red (romaine heart and sprouts/ tomatoes/cabbage) but aside from the romaine and the actual dressing, these items simply don’t fit the palette of the very dressing its topped with! It looks very thrown together and lazy. Third, it just looks freaking stupid. It is a half-assed attempt by some line cook working at a high end restaurant who doesn’t care, or works under a chef who doesn’t care or have real talent. Get on my level!